New rules proposed for oil and gas drilling in Michigan are getting a mixed response, at best, from watchdog groups. The rules would apply to a type of drilling often referred to as “fracking.” Critics say the proposed changes continue to favor the oil and gas industry over neighbors and the public. The official line in Michigan has long been that drilling for oil and gas is well-regulated and done safely. But many people are not convinced. Hal Fitch is the head of the Office of Oil, Gas and Minerals. He says they are responding to those concerns. "We saw some need to make some changes, some improvements, partly because of changing technology, partly because of public concern out there over hydraulic fracturing," he says. Oil and gas wells have been drilled here for most of the past century. But a new method, called horizontal hydraulic fracturing, goes after energy sources that are much deeper in the earth and locked away in rock formations. It takes millions and millions of gallons of water to break up or fracture all that rock and the water gets mixed with chemicals. There are no reports of drinking water being contaminated in Michigan by this newer drilling method. But one of the proposed rules would require companies to test nearby drinking wells before drilling. “So then, if there’s any question about contamination from the operation, we’d have something to compare it to,” says Fitch. Some people who have been urging the state to take the dangers of fracking more seriously are not impressed with the proposals. Tom Baird is with a group called Anglers of the Au Sable. He says the proposed rules do nothing to guard pristine rivers like the Au Sable and Manistee. “These water withdrawals are so severe that in a given case they can dry up a stream, or almost dry up a stream, and have a severely adverse impact on the cold water resource and the fishery, and that’s the kind of thing, the Pure Michigan kind of thing that northern Michigan’s economy is based around, it’s not based around oil and gas,” says Baird. Baird’s group has been working with Michigan State University to monitor stream flows near where drilling has occurred. They say their data show fracking nearly dried up the north branch of the Manistee River. The state disagrees with that conclusion. There is already a tool used by the state to evaluate proposed water withdrawals. But Tom Baird says that tool doesn’t work. In one case, a drilling operation ran dry even though the state’s assessment said there should have been plenty of groundwater. “And they also wound up purchasing water from, I think, Mecosta and Kalkaska municipal systems because they couldn’t get enough water out of the ground,” he says. The proposed rules also address a different problem related to water and fracking: getting rid of contaminated water after the drilling is done. Contaminated water from gas wells has been spread onto dirt roads in Benzie, Kalkaska and Cheboygan counties to control dust. The new rules propose fines and even criminal penalties for people who spray contaminated fracking water. They're still a proposal, one the DEQ has been working on for months. They’re close to being finalized. James Clift at the Michigan Environmental Council says they are a step in the right direction, but there are still changes he would like to see. Clift says it can be tough to get significant changes at this stage in the process. “But I think if enough people in the public raise their voices, we’ve seen changes in the past,” says Clift. Public hearings are expected in the next couple months. We keep seeing media accounts that an operator in NW Michigan ran the aquifers dry and had to buy water from a local municipality last year. In fact, the operator drilled temporary water wells on the site, which is common. One of those temporary water wells collapsed. The operator was on a tight timeline, where even a single day of delay costs tens of thousands of dollars. Buying water from the municipality kept them on track. Will proposed regulations change fracking in Michigan? 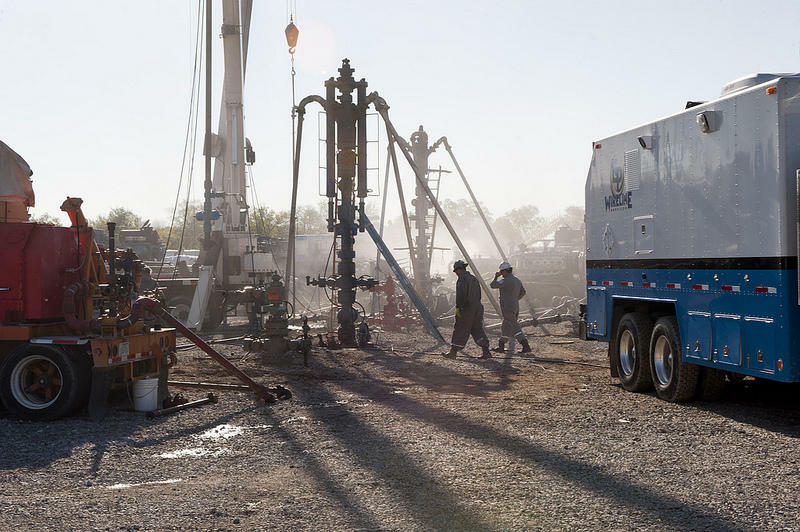 Michigan’s Department of Environmental Quality proposed a list of new rules for hydraulic fracturing in the state — commonly known as fracking. Fracking is a process where developers pump high-pressure streams of water and chemicals into a well to clear a path to hard-to-reach deposits of natural gas. So just what are these proposed new rules? And what could they mean to the future of fracking in Michigan? James Clift is the policy director of the Michigan Environmental Council. He joins us to discuss the new regulations.